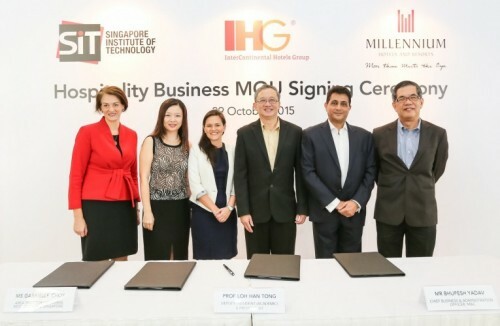 The Singapore Institute of Technology (SIT) is the first Singapore university to sign a Memorandum of Understanding (MOU) with two leading international hotel groups – InterContinental Hotels Group (IHG®) and Millennium & Copthorne Hotels plc (M&C) – to establish education and industry partnerships. The aim is to provide students with exposure to the hospitality industry and real-life business environments. The collaboration demonstrates strong industry support for SIT’s Bachelor of Hospitality Business with Honours degree programme, and will strengthen SIT’s unique Integrated Work Study Programme (IWSP) by allowing students to gain work experiences at corporate offices or in hotels owned or operated by IHG and M&C over a longer period. The MOU was signed by Professor Loh Han Tong, Deputy President (Academic) & Provost, SIT, Ms. Gabrielle Choy, Area Director of Human Resources, IHG Singapore and Mr Bhupesh Yadav, Chief Business & Administration Officer for Millennium Hotels & Resorts (MHR) . SIT’s Hospitality Business degree programme, which was launched earlier this year, is the first Hospitality undergraduate degree offered by an autonomous university (AU) in Singapore. Aligned with the national SkillsFuture movement, the programme places a strong emphasis on skills mastery with a broader focus on the business of hospitality beyond management issues. Graduates will not only learn about the fundamentals of hospitality management, but will also understand the business of hospitality from an owner’s perspective. To help graduates stay relevant, the applied learning approach is delivered through enhanced collaboration with industry partners that provides graduates with an industry-focused grounding. Students have the opportunity to attend a four-month long industrial attachment and an eight-month long work placement under the IWSP, where they will gain exposure to the hospitality industry and experience the rigors and challenges in a real work environment. This strong partnership with industry also comes in the form of guest lecturing, company visits and the use of real-life case studies. Professor David Jones, Programme Director for the Hospitality Business degree programme said, “The degree will offer our students a holistic education, and provide graduates with realistic expectations and a good understanding of the nature of their jobs. This collaboration with InterContinental Hotel Group (IHG) and Millennium & Copthorne Hotels plc (M&C) will allow us to expand our IWSP, in particular, and immerse students in a real work environment”. ”This collaboration is aligned with our hotels’ commitment to develop future leaders in hospitality. It is a good platform for students to hone and develop what they have learnt in classrooms through real life situations. It also helps to plug the labour shortage that the hospitality industry is facing. At Millennium Hotels and Resorts (MHR), staff training and development is key to building up a productive and highly engaged team,” said Mr Bhupesh Yadav, Chief Business & Administration Officer for MHR. IHG® (InterContinental Hotels Group) [LON:IHG, NYSE:IHG (ADRs)] is a global organisation with a broad portfolio of hotel brands, including InterContinental® Hotels & Resorts, Kimpton® Hotels & Restaurants, HUALUXE® Hotels and Resorts, Crowne Plaza® Hotels & Resorts, Hotel Indigo®, EVEN™ Hotels, Holiday Inn® Hotels & Resorts, Holiday Inn Express®, Staybridge Suites® and Candlewood Suites®. Hotels in Singapore operated by IHG include InterContinental® Singapore, Crowne Plaza® Changi Airport, Holiday Inn® Singapore Orchard City Centre, Holiday Inn® Singapore Atrium, Holiday Inn Express® Singapore Orchard Road and Holiday Inn Express® Singapore Clarke Quay. IHG franchises, leases, manages or owns more than 4,900 hotels and 727,000 guest rooms in nearly 100 countries, with more than 1,300 hotels in its development pipeline. IHG also manages IHG® Rewards Club, the world’s first and largest hotel loyalty programme with more than 90 million members worldwide. InterContinental Hotels Group PLC is the Group’s holding company and is incorporated in Great Britain and registered in England and Wales. More than 350,000 people work across IHG’s hotels and corporate offices globally. Millennium Hotels and Resorts is one of the world’s largest owned and managed hotel groups operating a portfolio of more than 120 hotels worldwide, including Grand Copthorne Waterfront, Orchard Hotel, M Hotel, Studio M and Copthorne King’s Hotel in Singapore. This dynamic hospitality group has an outstanding reputation for excellence, with a commitment to our guests that extends across Asia Pacific, Europe, Middle East and North America. Properties under the group are placed into three collections: LENG'S Collection, MILLENNIUM Collection, COPTHORNE Collection. Each collection has its own distinct personality, character and clearly-defined hotel brands within it; tailored to suit different types of guest.